In my announcement of this book in my last BookNotes blog post (January 7, 2009) I ruminated on the ways in which many Christians tend not to be very articulate about how they relate their Sunday-morning worship to their Monday-morning work. Or, how some churches or para-church ministries tend to whip people up into (good) enthusiasm for this or that cause, project, emphasis, or calling. I myself have hoped that folks I knew–students I taught, Bible study groups I knew, customers here at the shop or my own congregational friends—-would get excited and learn to specialize in social justice work, peacemaking, or creation-care, only to be disappointed when that race relations study group feel flat or that Bread for the World chapter fizzled out. Similarly, I had hopes that many would see their professional lives as the most obvious place they served Christ and learn to use the language of calling and vocation, resulting in new marketplace ministries, study groups on calling and career, prayer requests about the job site and the ethical dilemmas they faced within their mission fields of corporate America. How we long for more astute Christian conversation about the arts, film, culture. Many good folks, and many good friends, are doing wonderful and dedicated work and while there are obviously many shallow and nominal churches that can’t get much of a vision for anything of substance, there are many who are vibrant and trying to equip people to think outside the sanctuary. We are glad and grateful, and even harbor a bit of pride that we’ve on occasion helped fan those flames, sold some books, introduced people to authors or organizations, served as networker or resourcer. There are more solid and interesting Christian books about both social concern and workworld ministry, cultural engagement and thinking about the arts and sciences, say, than ever before! We live in thrilling times as younger evangelicals are rejecting legalism and a fixation on churchy and are living as spiritual leaders, working as cultural entrepreneurs. Just think of this years much discussed release Culture Making by Andy Crouch (IVP; $20) (and how we here at BookNotes and our friends at catapult and comment are mentioned!) Yes, much, much is good and we see many God-honoring accomplishments (as we hope you do) from our vantage point in this small corner of the Kingdom. Yet, I wrote in the last blog, much of the recent flurry of new missions, websites, publishing, and projects may be short-lived, and sometimes feels haphazard, piecemeal, ad hoc. Most folks I know, from the most apathetic or nominal churchgoer to the most energetic Christian servant, are not sensing the rest of God, not seeing their lives cohere, not feeling integrated. They may be inching towards a more Biblically faithful, missional Kingdom vision, but they still don’t seem to “see” all of life in light of faith. Some otherwise thoughtful Christians think the most awful stuff in one side of life; leaders who seem to have a mature perspective on some things do the darnest things in other arenas. Faith, for many, is still something “added on” or alongside of the ordinary stuff of life. By way of introducing this splendid new book, I insisted that a major, serious, life-saving practice for the project of nurturing whole-life discipleship, the kind of integrated and consistent faith that sees God at the center of all things and refuses dualism and cultural accommodation, is to be intentional about regularly studying, thinking through, talking about what constitutes a uniquely Christian world-and-life-view. Yes, we are excited about and are confident about the urgency of selling books about a distinctively Biblical worldview. We’re told we are one of the few stores in the nation that have a “worldview studies” section. I wanted to tell you just a bit more about why this book is so helpful and why it should be noticed. As most worldview books do, this carefully explores the fascinating sub-categories of questions, the multitude of matters that we must understand if we are to be fruitful in our worldviewish living and our worldview conversations. For instance, just what is a worldview, anyway? And why, again, does it matter? How is worldview different than just knowing theology or being dedicated to our religion? What is the role of the Bible? How can we “see” life in light of the grand narrative unfolded in the Scriptures? What should we know, instance, about the essential goodness of God’s world (derived by the doctrine of creation)? What should we think about sin, being aware of and troubled by the horrific nature of sin and dysfunction even as we assert that, in Christ, the curse is being lifted and God’s reign extends “far as the curse is found”? Do we really belief that the end of things is not really an end (where we jettison history and are removed to an ethereal dimension called heaven) but is a new beginning with new creation, as the city of God brings healing and restoration and rescue to this good but hurting world? (If we tell others about faith in evangelism, but we explain this four-chapter story, or is it really just about sin/forgiveness?) How can being four-storied “creation-fall-redemption-consummation” Christians make a difference as we share with others that everything we do matters to God, that all things have eternal significance, and there is, therefore, no hard distinction between the realms of the so-called sacred and secular? How does all this stuff effect our daily experience of life? How does it shape our character as we involve ourselves in churches that teach this full-orbed Christian perspective? What does it really mean to “take everything thought captive” and once we learn to do that, what difference does it make in the seemingly mundane moments of ordinary holiness–shopping, voting, choosing movies, cooking, singing, or making up our minds about public controversies such as abortion, global warming or health care policy? And, too, how are worldviews—the meaning systems that help us orient ourselves in the world—-communal in nature? Is it proper to talk about the worldview of our culture? Is there an ethos amongst our neighbors that shapes our society guided by what they share as common vision of the purpose of reality? Do our schools and media outlets presume or reinforce that basic way of life? What should we do, turn off the news? Send our kids to private schools? Protest Desperate Housewives? And what difference does the local church make in all of this? A Christian vision of life and times will surely equips us to live with the answers to these things in our very bones, a part of who we are, how we “see” and presumed into the habits of our ordinary living and speaking. rs practical sorts of insights (although never simplistic or glib), helping us not only gain this comprehensive perspective rooted in our understandings of the broad scope of Christ’s relevance–He is Lord of all and redeeming all of his creation!—but sensing a direction to pursue, a path towards which to journey as we together learn to seek first God’s Kingdom. It is, as I’ve said, these kinds of books, and this one in particular, offers a take on an essential and urgent story to understand, explains a central bit of material to grasp and absorb, which is vital Christian insight for living well. What could be more practical, I often say, than the rather simple act of polishing your eyeglass lenses, or getting proper prescription for your glasses? This book is a cheap trip to the optometrist. Further, this book places this contemporary vision of a uniquely and distinctively Christian way of seeing and living, based in this worldviewish eyeglasses adjustment, into the crossroads of the early 21st century landscape. That is, the stories our culture tells us, the advertisements and movies, the journalists tellings and the science reports, the textbooks used in schools and, sometimes, even the sermons we hear in church, are, in one way or another, teaching us to believe in the myths and values of the modern world, even as that modern world is changing. The voices and values coming at us are a jumble, set into this time of cultural crisis, this shifting epoch in which we now life. I refer to the shift from the story of modernity (faith in science, a rationalistic worldview, the confidence in progress, individualism and self-assurance, the ascendancy of the West with its systems and bureaucracies, institutions and values) to the era of postmodernism. What comes after modernism is perhaps yet to be seen but there little doubt that we “aren’t in Kansas anymore” and that, as my friend Walt Mueller’s lovely collection of family essays put it, Opie Doesn’t Live Here Anymore. (Standard; $12.99.) From the rocketing of iphones into our social experience to the rise of an experience economy, from the multi-culturalism that we now celebrate to the rejection of the older absolutes of science, from the disenchantment with suburban sprawl to the mocking irony that is now standard humor for the millennial generation, we have are moving rapidly into a new era. It seems to me that the only things that are staying the same are our age-old fascination with materialism, and, despite the global financial crisis, the virtual world of postmodernism is still hyper-consumeristic. (See the spectacular book, creative and interesting called The Trouble With Paris by Aussie Mark Sayers (Nelson; $14.99 and the hip and stunning DVD; $39.99) for a very helpful survey of how to break out of this fake world of plastic promises, as the subtitle puts it. It says, interestingly, the Biblical story of incarnation and the subsequent Christian worldview is the antidote to virtual restlessness and glamor-driven materialism. It is fabulous for high school or college age students.) And, sadly, we continue to war with one another, nation and against nation, tribe against tribe. (Our authors do not talk about this much, as I wish they would have; they do cite Hope for Troubled Times by Bob Goudzwaard, Mark VanderVennen and David Van Heemst (Baker; $19.99) which has a very thoughtful critique of the ideology of militarism and national security.) Older norms about right and wrong give way in the social sector—teen pregnancy and the breakdown of the family is rampant, for instance—and in the global world, sexual trafficking and disregard for civilian populations in war is again on the rise. In some circles the helpful deconstruction of the idols of autonomous Reason has given way to nihilistic relativism. (That is, we perhaps used privilege only scientific data and the reductionism of propositions but now some believe in no truth, content to shrug “whatever” about nearly anything.) Add to this the rise of economic globalization and the reaction of radical Islam, and you deepen your awareness of just how complex this junction is. 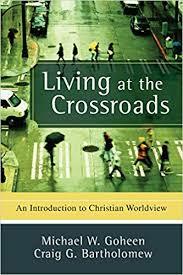 Yes, we are “at the crossroads” and the Christian worldview–our daily discipleship that is lived out in joyful and coherent ways that reflect our deepest convictions about the nature of things, who we are and why we are here—must be understood, lived and spoken of in the pluralistic context of the “crossroads” of modernity and postmodernity. Although the above is my own rambling quick reminder of the shifts of our times, this is the cultural setting that Goheen & Bartholomew have diagnosed wisely. Is this too much for you to study? Is it too much for your church group, college fellowship, or Bible club to tackle? I don’t think so. We live in serious times and such serious steps are called for. I hope Living at the Crossroads is an important resource for you and yours this coming year. If you know this worldview stuff, it is an excellent refresher, or, perhaps, “next step” in deepening your awareness, vocabulary, conviction and enthusiasm for this wide-as-life-vision of the meaning of the gospel. If you have not read a book about worldview, then this is a great and serious starter. That they are not only informed by the worldview books I mentioned in the last post (Transforming Vision, Creation Regained) but the great 20th missiologist Leslie Newbigin and the great 21st Bible scholar N.T. Wright, makes them especially reliable guides. And—please understand—this is not just for eggheads or intellectuals. We all long for coherence and integrated lives. We are not content with a narrow faith and the more attentive we are to the Bible, the more we come away informed by this comprehensive claim that Christ makes over all of life. Such coherence and integrity leads to joy. It is as simple as that: life lived out of a distinctively and intentional Christian worldview is more complicated (everything matters) and demanding (we cannot conform to the ways of the world, not in voting, or shopping, in sexual matters or business matters or recreational matters.) Yet, in that cost of discipleship comes joy. I think Rick Warren’s Purpose Driven Life touched something deep about all this, and it is revealing just how popular that was a few years back. In this postmodern world, we sense things unravelling, and we yearn for meaning, purpose, direction. A comprehensive framework for understanding things makes for a purposeful life. It makes for a joyful life. It makes for a righteous life. Mike grew up in a Baptist church. The gospel that was preached there was one of individual, future, and otherworldly salvation. It was all about going to heaven when you die…During Mike’s seminary years he began to see that the gospel that Jesus preached was a gospel of the Kingdom. The goon news is much bigger than Make has been led to believe: God is restoring his rule over all of human life in Jesus and by the Spirit. Further reading during those seminary years in literature that explored the Christian worldview began to open up the implications of this scriptural insight for a Christian approach to the public life of culture. It was exciting, akin to a second conversion! The gospel had something to say about all of human life. The story continues to explain how Mike and his wife began to be more intentional in studying the arts, how music and performance became important to their children and how educational perspectives and practices changed for them. It continues, “For Mike, worldview is about opening up the wide-ranging scope of the gospel and the church’s mission to embody that gospel. Few things excite him as much as helping Christians to see the length and breadth and depth of God’s love for us and his world.” Who wouldn’t want to read a book by a guy who is turned on by that calling, helping us understand these things? Craig, now a highly regarded and published Biblical scholar, has an even more fascinating story. He grew up apartheid-era South Africa. Craig was radically converted to Christ in his teens through the evangelical youth group of the Church of England (into which he was eventually ordained as a minister.) Like Mike’s Baptist church, Craig’s Anglican church was evangelistic and alive but had nothing to do say about the oppressive, racist social context in which they lived. Really committed Christians went into “full time ministry” (as pastors or missionaries); it was better to stay away from politics, since, after all, (or so it was reasoned) the government was appointed by God. …He went to Bible college in Cape Town, where he was exposed to Reformed theology and the worldview thinking of Francis Schaeffer (though this was never explicitly brought to bear on the South African situation.) Later Craig began to think through Schaeffer’s work, and he realized that if the gospel is a worldview, then it applies to all of life, including politics—a dangerous insight to have at that time in South Africa. …Craig believes that what South Africa went through then, and the general failure of the evangelical Christians to relate their faith to the realities of South African life, have a great deal to teach us now about the vital importance of understanding the gospel as a worldview. We know how from the Truth and Reconciliation Commission what terrible injustices were perpetrated in South Africa during the apartheid years under its’ “Christian” government. How was it that evangelical Christians could not see the evil right in front of them? How was it that, on the whole, evangelicals ended up reinforcing this evil rather than challenging it? One important answer is that they lacked a coherent Christian worldview. How different might the history of South Africa have been if evangelicals there had combined their “passion for souls” with a sense of Christ’s Lordship over all of life? It is not just fundamentalist churches that have disengaged from social concerns or who have been “so heavenly minded that they are little earthly good” as the old saying has it. Mainline churches, too, have, in their own ways, segregated faith from life. Or water-down faith to some subjective inner hope or outward ritual. Some who are most sophisticated about Biblical truth fail to live by its over-arching themes. Some, as I suggested in our last post, get fired up about a proper and good Biblical mandate—-concern for the poor, world missions, contemplative prayer—and yet don’t see this new-found passion as much more than a quick-fix cure for what ails the mediocrity of the church. Or they fixate upon it as the latest fad, only to move on to something else—-contemporary worship, fighting trafficking, keeping Sabbath, doing hospitality—when that fails to provide clarity and fruitfulness. All kinds of Christians, from all kinds of churches, and all sorts of congregations, I am confident, would benefit from studying this kind of material to give substance and foundation to the various aspects of their discipleship, and to frame their work by the biggest meaning-giving picture. Goheen and Bartholomew have seen the worst of privatized, sentimentalized piety, and (since they work in this field, especially in Christian higher education, they’ve seen the dangers of overly abstract formalized worldview categories, as if a worldview isn’t really a matter of the heart, which is is. They have a splendid grasp of the Bible, and how the story of God makes sense of our lives in ways that the secular Enlightenment of the West cannot. They understand the crossroads, they realize the importance of the question, as one chapter puts it “What time is it?” They can help us makes sense of things. We applaud them for their work, we are happy that the publisher chose to release this now, and we are very happy to commend it to you. Since they move teach this material at Redeemer College in Ontario, they have developed a great website, with teaching ideas, outlines, discussion resources, even slides. Check it out here. Let us know if we can talk further about this field, or if you have other concerns about this discipline of developing a Christian worldview perspective. We believe that an embodied and timely faith can make a difference, in our lives, in our churches, in our communities and in our world. Nothing would please us more than to know folks are brought great joy as they live for a great purpose, glorifying God by helping rescue the planet. We are selling books for that reason. We hope you buy some, for that reason. A closing comment seems proper, since they themselves have a brief closing section. After a few good chapters that offer worldviewish insights for thinking distinctively about several areas of life (business, politics, education, sports) they have a final word to pastors. Those who are called to help others live out daily discipleship, to connect faith and lifestyle, to understand worldview as it enables a coherent way of life must be particularly wise and careful as they teach and embody this comprehensive style of faith. Our witness in the world is, in fact, communal, so the renewal of the local church is of utmost importance. And, they remind us, that includes guidance in the most fundamental things: learning to trust God as we inhabit rhythms of rest and solitude. Indeed, ” Only a vigorous spirituality can sustain us in our task.” From Eugene Peterson to the Catholic document Starting Afresh from Christ, they offer wise counsel about sustaining an active and faithful witness by balancing a dynamic interaction between action and contemplation, work and prayer, witness and worship. Guidance by the Spirit into this multi-faceted and robust Kingdom lifestyle will give hope. Maybe we won’t see vivid signs of cultural renewal, maybe we will not experience much social change or church growth, but we will be people of hope. This final postscript about these gentle and deep things reminds me of how gifted these authors are to keep us well-rooted and Biblically-shaped. This is, dare I say it again, life changing stuff, wise and good and important.